Often described as a feast for the eyes, Pushkar Fair is among India’s famous religious festivals and livestock fairs. The fair offers a once in a lifetime magical experience for travelers looking for an out of the world experience. The Pushkar Fair will definitely enrich your trip to India. This itinerary not only includes the Pushkar Fair but much more. Delhi includes both the old with its Mughal architecture and bazaars and the new with Lutyen’s architecture. Udaipur itself is the unmissable city of lakes with its forts, temples and palaces among which the stunning Lake Palace stands supreme. Jaipur, Rajasthan’s magnificent capital was painted pink to welcome the Prince of Wales in 1853. The Taj Mahal in Agra is just as you imagine it to be – a spectacular site that radiates the love of Shah Jahan for his beloved Mumtaz Mahal. Experience royal lifestyle when you stay at the exclusive Sadargarh whose towering walls overlook the village of Lawa. Ranvas lies within the ramparts of Nagaur’s magnificent Ahhichatracharh Fort on the edge of the Thar Desert. Over many years, this exquisitely beautiful fort has been painstakingly and brilliantly restored to its former glory through the efforts of the Maharaja of Jodhpur. Boasting a truly spectacular setting, the impregnable looking and remote Ramathra Fort stands imperiously atop a hill in the rugged Rajasthan countryside south of the Golden Triangle. Our representative will meet you in the arrival area of the airport after you clear all immigration and customs formalities. Depart for your hotel where you will check in for your stay. Delhi stands as the capital of modern India. Here you can see the mingling of the ancient and the modern. Delhi is made up of seven ancient cities, spanning the period from the 11th to 20th centuries. Delhi has seen the rise and fall of many emperors who have left behind a plethora of monuments that commemorate the grandeur and glory of bygone ages. Very few cities in the world can express such a profusion of architectural styles. Morning enjoy a special Rickshaw tour in Old Delhi. You will be transported 400 years back and will ride on a rickshaw through the narrow lanes of Chandni Chowk known as the Moonlit Square of India. Witness the architectural marvels, the multicolored facades, beautifully decorated shops, ethnically dressed men and women and be bombarded by the cries of hawkers and fragrances emanating from the potpourri of eateries that line these historical alleys. Mughal Emperor Shah Jahan (1592-1666) built the walled city of Delhi on the banks of the holy River Yamuna. It had a magnificent palace known as the Red Fort, impressive mansions, enchanting bazaars, elegant shrines, royal gardens and fountains at every corner to romance ones’ senses. The Emperor’s beloved daughter, Jahanara, designed a major street called Chandni Chowk in front of the Red Fort with a canal running down the center and pools at major intersections reflecting the moonlight. The total duration of the tour will be 3 hours – 3 hours 30 minutes. It is an extensive tour that covers 20 main sites that include palaces, mansions, elegant shrines and colorful bazaars. The tour ends at an Old Haveli (mansion) built in1860 which has a photo gallery depicting the lifestyle of Mughals and a small lounge to relax. Afternoon drive takes you along the ceremonial avenue, Rajpath, past the imposing India Gate, Parliament House and the Presidential residence. Visit Qutab Minar, the five-storied tower with a 14.4meter base that tapers up to two and a half meters at the top and is visible for a long distance around. Today assisted departure transfer to the airport to board the flight for Udaipur. On arrival at Udaipur, you will be met and transferred to the hotel. Dotted with marble palaces, hibiscus – laden gardens and fountain pavilions, Udaipur appeals to the imagination of poets and painters, travelers and writers like no other city in the country. The city’s inherent romance and beauty and its remarkable past redolent with episodes of heroism and splendor, continue to enthrall the visitor even today. Udaipur, the City of Dawn, looms up like a vision in white. Afternoon proceed for a guided walk where you will have the opportunity to visit the famous ghats and historic temples on the banks of Lake Pichola. Visit an ancient step well which was used for drinking water by the locals. Join a family at their private residence for a cup of tea and snacks in their 150 year old residence decorated with fascinating fresco paintings and mirror work. From the clock tower, you will move towards the lane where the silversmiths and gold making workers are busy making and selling ornaments. Observe the traditional way of making clay pottery and water pitchers. On this interesting walk you will see the bustling markets of Udaipur city where you will come across the vegetable, oil and bamboo markets. In the morning visit Eklingi and Nagda Temples. Eklingji: 14 miles North-East of Udaipur is the village of Kailashpuri which is known for its 108 temples surrounded by a high fortified wall, the whole complex is known as Sri Eklingji temple and has been a holy site associated with Lord Shiva since ancient times. The present structure however dates from the 16th century. Nagda: Close to Kailashpuri down a rough country road, Nagda is believed to have been established by Nagaditya, the fourth Mewar king, a descendant of the Guhadatta who was born in a cave in the Aravali Mountains. There are several temples dating back to the fourth century A.D. Afternoon take a city tour of Udaipur where you will visit the vast and exquisite City Palace, a well-fortified, majestic white monument stroked all over in granite, marble and mosaic displayed in the sparkling white filigreed balconies and windows, ornate arches and cupolas atop magnificent octagonal towers. The main entrance, a triple-arched gate named the Tripolia, was built in 1725 and is a marvel. The Suraj Gokhada, the Balcony of the Sun, where the Suryavanshi Maharanas of Mewar presented themselves in times of trouble to the people to restore their confidence, is also a fascinating sight. Visit Sahelion-ki-Bari, the Garden of the Maids-of-Honor, which has numerous fountains in four pools, embellished with delicately chiseled kiosks and elephants. Later enjoy a boat ride on Lake Pichola, covering the City Palace and Jag Mandir. This is a refuge of the rebel Mughal prince Shah Jahan, soon to be the creator of the incomparable Taj Mahal. The drive (approx. 4 hours) takes you across the Aravalli Hills, the oldest mountain range in the world. The scenery along the way is superb and you will see many vignettes of Rajasthani rural life. Among the sights you will see are colorful villages, farms where an ancient system of irrigation using bullocks and a Persian wheel are still in practice, outdoor schools and the sartorially vibrant people who add a splash of color to the countryside. There is an endless opportunities for photography. Your destination is one of the architectural gems of the area, The White Marble Temples at Ranakpur. Ranakpur is one of the five important pilgrim centers for the Jain community. The whole, including the extraordinary array of 1144 pillars each distinct in design, carved ceilings, and arches decorated with friezes depicting scenes from the lives of the Jain saints, is fascinating. On arrival at Sadargarh, check into the hotel. Sardargarh, one of the magnificent forts of Rajasthan, is an extravagant creation by men of a bygone era, placed amidst the mountains and deep forests of Chuppun. Sardar Singh, one of the most powerful Dhodhias, built the Sardargarh Fort during 1738 to 1743. You can see the ramparts of the mystery filled Sardargarh, like a great ship anchored at outer sea, much before you get close to the gigantic walls soaring high above the low lying village of Lawa. The Mahal of the Ravala with 21 suites, also known as the Zenana Mahal, are today part of the Sardargarh Heritage Hotel. Each suite here is known by a derivation of the name of the Queen who resided in it, in medieval times. As far as possible, the authentic elements of the fort have been retained in the hotel. For instance, the pillars, doors and mantles are all authentic originals. The fort still retains its medieval underground infrastructure. The passage systems, rooms, halls, granaries and stores are open today to guests of the hotel. The hotel offers a breathtaking view on all sides. To its north is the enthralling view of the lake. The Darbar Hall offers a charming vista of the village. And looming over the horizon is the imposing Aravalli Hill Range. In short, a sabbatical at Sardargarh will be a unique experience. In the morning explore the fort. During the stay you can enjoy a horse ride or a camel ride within the fort, pay a visit to the local market or even be a royal guest to a rural family to have a direct experience of their daily life. Afternoon proceed for an interesting jeep safari in the region for spotting leopards and other wildlife as well in and around the palace within the radius of 5 – 6 kilometers. High – density spotlights are used during the safari to spot the animals. Today morning depart by surface for Jodhpur (approx. 5 hours), en-route visit the massive Kumbalgarh Fort. Located north of Udaipur in the wilderness, Kumbhalgarh is the second most important citadel after Chittorgarh in the Mewar region. Cradled in the Aravali Ranges the fort was built in the 15th century by Rana Kumbha. Because of its inaccessibility and hostile topography the fort had remained un-conquered. The fort’s thick wall stretches some 36 kms and is wide enough to take eight horses abreast. Maharana Fateh Singh renovated the fort in the 19th century. The fort’s large compound has very interesting ruins and the walk around it can be very rewarding. The Fort was build in 15th Century A.D by Maharaja Kumbha and has Seven Majestic gates and amazing ramparts, ideal for nature trail. The Fort is interspersed with many magnificent palaces and an array of ruined temples. On arrival at Jodhpur, check into the hotel. Post breakfast, you will be met by your guide for a guided tour of Jodhpur City where you will visit the massive Mehrangarh Fort. This is the most impressive fortress in Rajasthan. The 5 km long ramparts of the fort, perched on a 125 meter – high rocky cliff in the middle of the city, has four gates that can be approached by a winding road. The fort offers a panoramic view of the surrounding landscape. Inside the fort, you can see magnificent palaces adorned with intricately carved panels and latticed windows. These palaces house a fabulous collection of trappings of Indian royalty: palanquins, elephant howdahs, miniature paintings of various schools, music instruments, costumes and furniture. Visit Jaswant Thada memorial. This cluster of royal cenotaphs in white marble built in 1899 A.D. in memory of Maharaja Jaswant Singh II, also houses the portraits of various kings who ruled Jodhpur in the past. In the afternoon visit the Clock Tower Market. In the old city, clock tower is a prominent landmark. But the main attraction is the Sadar Market. The market has kept alive the old ‘haat bazaar’ culture. Sadar market is a lively, bustling, colorful market that runs from Sojati Gate to the Clock tower (which is late 19th century). In the distance you can see the vast bulk of the Meherangarh Fort that dominates the skyline for miles around. Though Jodhpur continues to be a leading center of wool, cattle, camel and salt, you will also find traditional jewelry, mojris slippers, famous riding breeches and colorful hand-printed cotton fabrics that are the fame of Jodhpur. Pretty much anything can be bought in the Sadar bazaar but the area around the clock tower specializes in spices. On arrival in Nagaur, check into Ranvas. This stunning hotel lies within the ramparts of Nagaur’s magnificent Ahhichatracharh Fort, on the edge of the Thar Desert. Over many years, this exquisitely beautiful fort has been painstakingly and brilliantly restored to its former glory through the efforts of the Maharaja of Jodhpur. Ranvas (formerly the ‘abode’ of the queens) comprises 10 very private havelis surrounding a large courtyard and pool area within a palace complex inside the fort walls. Each haveli is entirely different in shape, size and design and comprises 2 suites, a spa room, inner courtyards, covered verandahs and upstairs terraces. They have all been decorated in soft colors and are entirely in keeping with their origins, use and design, while at the same time having modern bathrooms, comforts and amenities. Afternoon is at leisure to enjoy your stay at this property. Nagaur, 135 km northeast of Jodhpur, was once a center of Chishti Sufi saints. The old city has several examples of pre-Mughal and Mughal architecture including temples, havelis and mosques, one of which was commissioned by Emperor Akbar. The ancient Ahichhatragarh fort has excellent murals and is currently being restored. Nagaur, 135 km northeast of Jodhpur, was once a center of Chishti Sufi saints. The old city has several examples of pre-Mughal and Mughal architecture including temples, havelis and mosques, one of which was commissioned by Emperor Akbar. The ancient Ahichhatragarh fort has excellent murals and is currently being restored. Post breakfast explore some of the interesting sites in the town starting with a visit to the Nagaur Fort which is an important building. This is the main tourist attraction here. The fort is built with sandstone and has been the epicenter of many battles and skirmishes. The fort was built in the 2nd century and there are many exquisite temples and buildings inside the Nagaur Fort. Another important place in the city is Tarkeen Dargah. It is an important site for many Muslims in the area and the town has a strong community of Muslims. The town also has a Jain Temple that has been built from glass and this is an important and sacred center for many Jains in the area as well. Pushkar, which means lake of the lotus blossoms, is an ancient settlement that dates back to the 4th century. It stands at the base of a hill called Nag Pahar, in a valley encircled by the Aravallis in central Rajasthan. Hugging it are 52 ghats that give onto a ring of about 500 white – washed temples, ashrams and dharamsalas. On the banks of the lake you will see holy men administering a ceremonial mudan to a screaming child as his pleased parents stand by with a coconut and flowers in their hands. Wandering the lanes of Pushkar or watching the people form a roadside stall as you drink tea is an exercise that can absorb you for days. The other thing you will notice is the indomitable spirit of Pushkar. Despite the distractions, it remains primarily a religious town. No alcohol or meat may be served within a five kilometer radius of the town. On arrival at Pushkar, check into the campsite. In the afternoon witness the Camel Fair. At this time of the year, during the auspicious full moon is the time for Pushkar’s biggest event, the annual cattle fair. People from far and wide gather here to trade in all kinds of cattle and farm animals, but especially camels. This is an amazing sight and incredible experience! 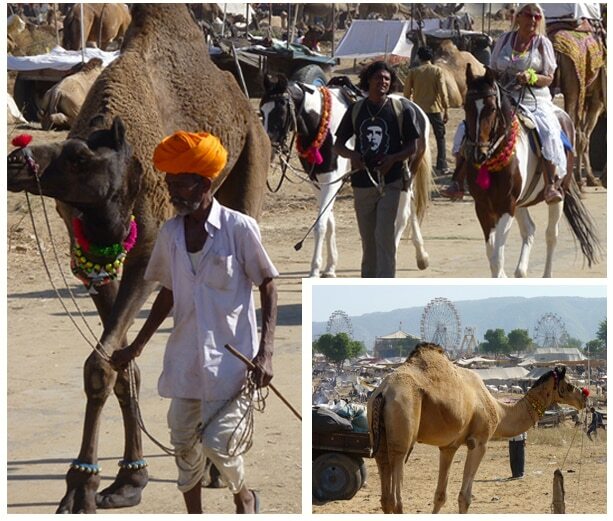 The annual Pushkar Camel Fair is an experience that will make for a magical sojourn to Rajasthan. A tented city is created adjacent to Pushkar lake during the full moon days for this fair and it is here that thousands of men and women cover the sand dunes and indulge in festivities, trade in livestock, handicrafts, participate in camel races, dances, drama, and music competitions. Today morning explore the Pushkar town that has a stunning mix of architectural styles. Most of the mansions and temples are between 200 and 300 years old, built by local chieftains and merchant families. You will be able to see the ritual ceremony being conducted on the holy lake. In the afternoon, attend the Pushkar Fair. Post breakfast visit the fair in the morning and afterwards depart by surface for Jaipur. (approx. 4 – 5 hours). In the afternoon drive to Jaipur. On arrival in Jaipur, check into the hotel. Jaipur is popularly known as the Pink City, thanks to the color of the buildings in the city. The city, built in 1727 A.D by Maharaja Sawai Jai Singh II, followed a grid system, which made it the only planned city of its time. A young Bengali architect Vidhyadhar Bhattacharya designed the city in accordance with Shilp Shastra, an ancient Hindu treatise on architecture. Evening is reserved for a special cooking demonstration /dinner with Thakur Durga Singh, the current custodian of Dera Mandawa who is a keen observer of history, culture, religion, current affairs, and is a bank of knowledge so vast that he has a point of view on anything under the sun. He is what one could call a modern traditionalist, actively seeking the use of modern technology and methods to support the principles of traditional living. The inquisitive can have endless conversations with him on a number of his projects like rain – water harvesting, biogas plant, solar heating and, even, healthy cooking. He would be more than delighted to share his experiences with you. In the morning proceed for a sightseeing tour of Amber Fort. High above the city, the towers and domes of the Amber Fort are reminiscent of scenes from some fairy tale. The palace itself is within the enormous fort complex and is replete with halls, gardens, pavilions, and temples. The Hall of Mirrors is not to be missed where one lit matchstick can illuminate the entire room. You will ascent the fort on elegantly draped elephants. In the afternoon visit the City Palace Museum where you can see an imposing blend of traditional Rajasthani and Mughal Art. The museum is resplendent with its collection of robes of royal princes, carpets, an armory of old weapons, miniature paintings portraying court scenes, battle scenes and processions, Also visit the awe inspiring Jantar Mantar (an accurate observatory built in 1726 AD). Included is a photo visit at the Hawa Mahal (Palace of Winds), a five – storied wonder with a spectacular pyramidal facade and overhanging windows with latticed screens, domes and spires. Today early morning experience the spiritual side of the locals by visiting colorful temples and discover some of the architectural wonders of this fascinating area of Jaipur. The walk has been carefully designed to offer a rewarding and enriching experience. The walking tour allows you to have a genuinely interactive experience by getting to meet the residents and to gain an insight into their traditional way of life. This is about a 2½ hour walk. On arrival in Ramathra, check into the hotel. Ramathra Fort has a commanding view of the countryside. One can sit on the top of the fort’s massive outer wall and look out over farmland, rugged scrub of the Daang plateau, Kalisil Lake and its irrigation canal. Sunrises are especially spectacular and at twilight one can watch herds returning from the jungle or the blue bull grazing in the forest scrub below. Water birds are the big attraction of Kalisil Lake which lies along the same flyway as the Bharatpur Bird Sanctuary just 175 kms to the north. Besides being a rich feeding ground for ducks, storks and cormorants that visit every winter, there are plenty of local water fowl like kingfishers, sarus cranes, stilts and herons to see year round. Kalisil Lake is large. Morning proceed for a complete walking tour of the Ramathra village which takes about 2 – 3 hours. You will see all kinds of work associated with tending crops and animals and caring for children. Absent is a bazaar with commercial traffic or food stalls. After the sun goes down, Bhajan-singing and community activities are more common than radio or television. Among its numerous shrines, the Ganesh Mandir and Shiva Mandir give the best flavor of local religious life. The pure white marble idol of Lord Shiva, the great Ascetic, is a masterpiece of early 18th century craftsmanship. In the morning depart by surface for Agra (approx. 5 hours) and en-route visit Fatehpur Sikri. Fatehpur Sikri, the deserted red sandstone city that was built by Emperor Akbar as his capital. Ponder the mysterious desertion of this capital city that was dramatically abandoned a few years after it was built. It was a veritable fairy tale city and its ‘ruins’ are still in a pristine condition. On arrival at Agra, check into the hotel. There is only one place in the world in which to see the Taj Mahal and that is Agra. The monument’s splendor is simply undeniable and creates an air of romance throughout the city. The decadent and sophisticated culture of the Nawab still permeates Agra and gives the city a unique Mughal character that some say make it more Indian than New Delhi. Morning visit the massive Agra Fort that was originally started by Emperor Akbar in 1565, but his son, Jahangir, and grandson, Shah Jahan, later made valuable additions to it. It houses the Dewan-e-Khas and Dewan-e-Aam (Halls of Private and Public Audience). Its walls and palaces are a silent witness to the rise and fall of the Imperial Mughal Empire and feature a variety of ingenious Islamic inspired devices (some decorative, some more practical) within the fabric of the buildings. It’s a citadel with marble palaces, ornate alcoves, and terrace pavilions. Late afternoon enjoy Hi Tea with local family and later proceed for Kachpura Heritage Walk. A narrow bridle path through agriculture fields near Mehtab Bagh takes you into the ancient village of Kachpura and Humayun’s Mosque. The walk ends in Mehtab Bagh from where you will have the opportunity to watch the Taj Mahal during sunset from across the river. Visit the Taj Mahal at sunrise. The Mughal Emperor Shahjahan built the Taj Mahal in 1630 AD to enshrine the mortal remains of his beloved Queen Mumtaz Mahal. The Taj Mahal manifests the wealth and luxury of Mughal art as seen in architecture and garden design, painting, and calligraphy. The 144 foot double dome of the Taj is capped with a finial and the four minarets each 131 ft high and crowned by an open octagonal pavilion highlight the perfect symmetry of the tomb. The filigree screen, meant to veil the area around the royal tomb was carved out of single block of marble. The Mughals believed that flowers were the symbols of the divine realm. Thus in the Taj, pietra dura has been extensively used to translate naturalistic forms into decorative patterns that complement the majesty of its architecture. The monument changes with light and presents different times of the day. Later depart by surface for Delhi (approx. 4 hours 30 minutes). On arrival at Delhi, you will be transferred to the International airport to board flight for home. Meet and greet services in major cities. All transfers, excursions and sightseeing tours will be provided by AC Toyota Innova. Entrance fees at all monuments listed in the itinerary for one visit only, road taxes, parking fee, fuel charges, interstate taxes, and porter age during all air-port transfers. Rickshaw cycle tour in Delhi. Hi Tea with local family + Kachpura Heritage Walk. Elephant / jeep ride for visiting Amber Fort in Jaipur. Private boat ride in Udaipur. All taxes, tolls, parking fees and service tax.